No SD cards. No uploads. No waiting. Real-time insights power real-time decisions in the field. Get the data you need immediately—no laptop or internet required. 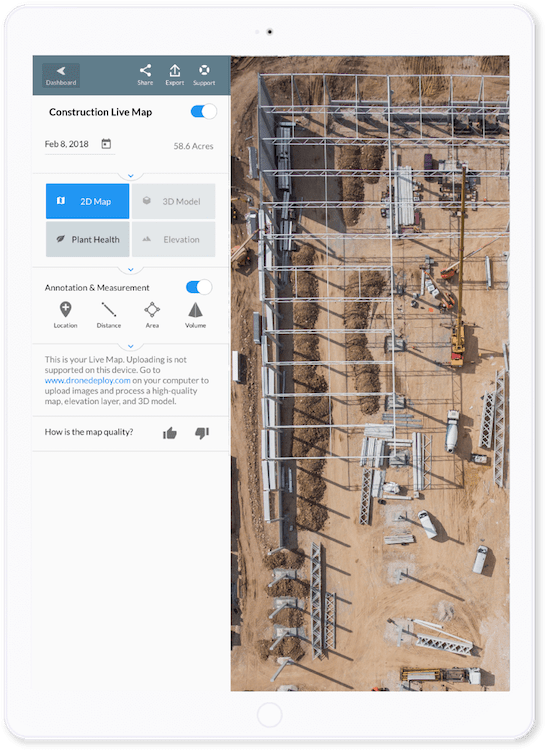 By producing a real-time map of a large construction or solar project, I can stay on top of site progress by counting solar arrays or monitoring progress and site conditions across the project from my mobile device. Live Map helps me end each day with confidence knowing where a project stands and what our subcontractors have completed so that we can provide the best product for our clients. Hours or days of waiting for crop imagery are over. We can capture real-time data in seconds without an internet connection, and begin making smarter crop management decisions before the drone hits the ground. 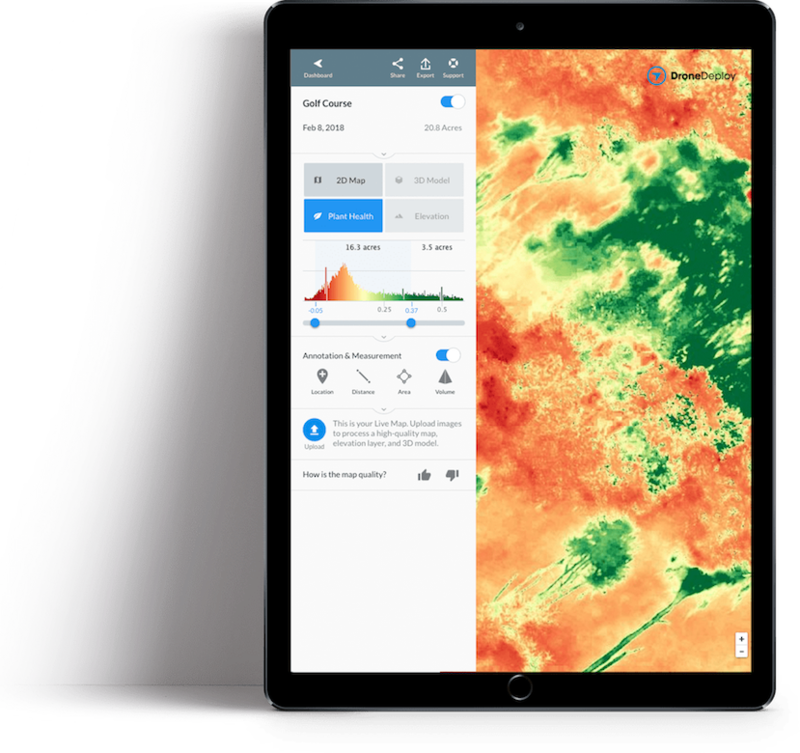 Live Map is a timely addition to DroneDeploy’s growing suite of trusted solutions. As more enterprises adopt drone technology across their operations, there will be an even greater demand for scalable mapping solutions that enable smarter business decision making in the field without compromising speed, quality, and a seamless experience. How do I use Live Map? When creating a flight plan on your iOS device, turn on the Live Map toggle to enable it. Then as your drone takes flight you will see your Live Map stitch on screen in real-time. 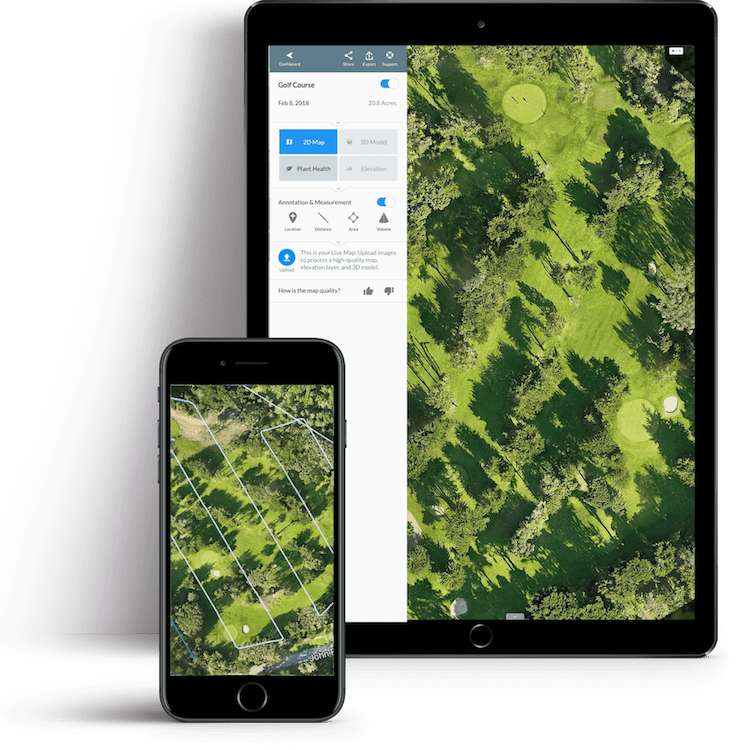 Is Live Map compatible with my drone and mobile device? 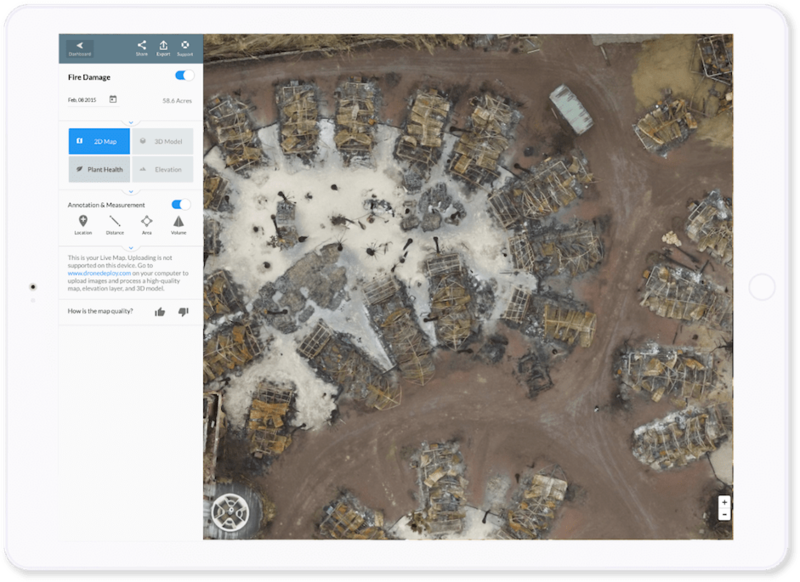 Live Map is compatible with DJI Phantom 4 drones and newer. It is only available for iOS devices manufactured in early 2016 or later (iPhone 6s or iPad Air 2 or newer). The newer the device, the better your experience will be. Any suggestions for getting the best results? The default flight settings will work well for Live Map. We also recommend avoiding areas that vary more than 75ft (25m) in elevation. Areas with small hills and buildings shouldn’t be a problem, but buildings or terrain taller than 5 stories (50ft or 15m) may cause stitching problems in the Live Map. View a complete set of Live Map Tips & Tricks to ensure high-quality. Do I need to be a paid customer to try Live Map? No, Live Map is available with your 14-day DroneDeploy Trial. After that, paid subscription customers have access to Live Map. What analysis tools can be used with Live Map? Plant health data from Live Maps can be viewed offline. Once the Live Map has synced with the cloud, you can make measurements and add annotations. Will I need to re-fly my mission to process a full-resolution map, or capture a 3D Model? No, Live Map will not interrupt your existing workflow. Plan flights as you normally would. Toggle on Live Map to generate a map in real-time. 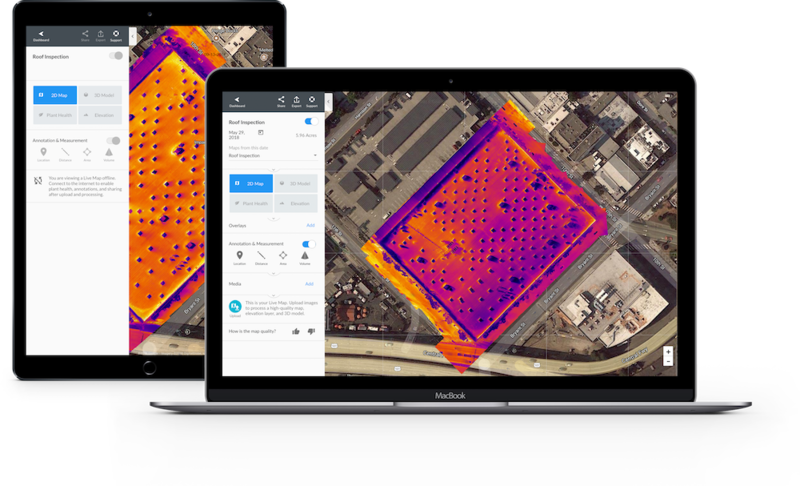 DroneDeploy will capture the images you need to create a full-resolution map and 3D model in parallel. You can upload these images for processing after the flight. Live Map is a one-of-a-kind technology that is under continuous development. Currently, iOS devices provide the best experience with Live Map. The computing limits of mobile processors and wide range of Android devices on the market make it difficult to optimize Live Map for Android at this time. Engineering Live Map to deliver the highest quality maps—while also being efficient enough to run in real-time—is a ongoing challenge our team is working to solve. Starting with iOS has allowed us to deliver this solution to customers much faster. We’ll continue to evaluate making Live Map available to our Android customers, but no specific date has been set at this time.